This one-of-a-kind vacation rental is available through the appropriately named Unique Home Stays. 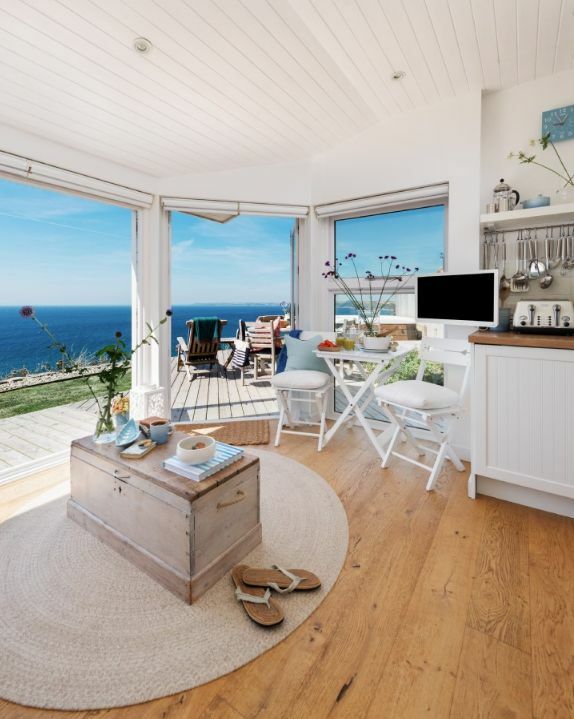 Nicknamed The Edge, the cottage sits atop a cliff with a stunning view of Whitsand Bay in Cornwall, United Kingdom. The interior is luxurious yet simple, creating a relaxing atmosphere accented with cool blues and bright whites. 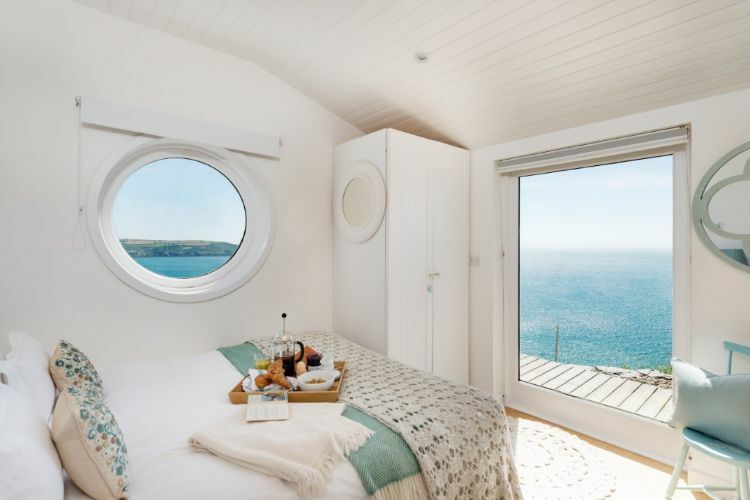 According to Unique Home Stays, the beach cabin was built with eco-friendly materials including sustainably-sourced cedar cladding, triple-glazed windows, and natural wool insulation. 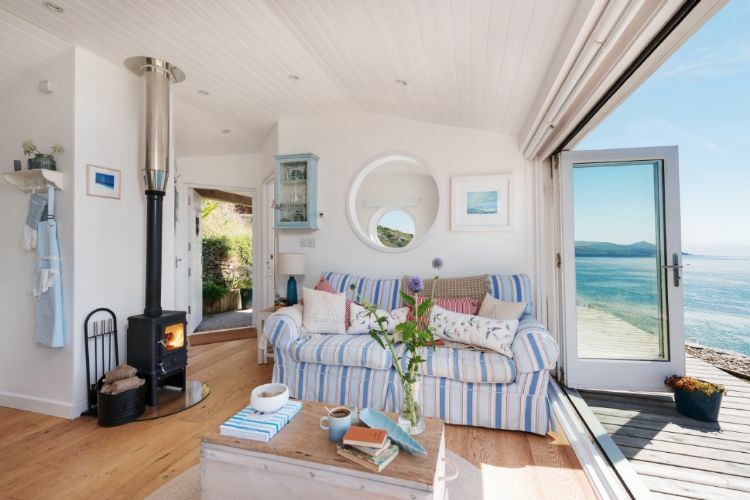 Take a look at the fresh interior below; no doubt you'll be dreaming of a seaside vacation in this gorgeous retreat. The colors chosen for the interior design mimic the blue ocean views just outside, enjoyed through the floor-to-ceiling glass retractable doors. A wood burning stove keeps things cozy on cool evenings. A small dining area is set up next to the kitchen, but the deck outside provides more living space and an additional spot for eating. The simple white walls and ceiling ensure that nothing distracts from the breathtaking views. 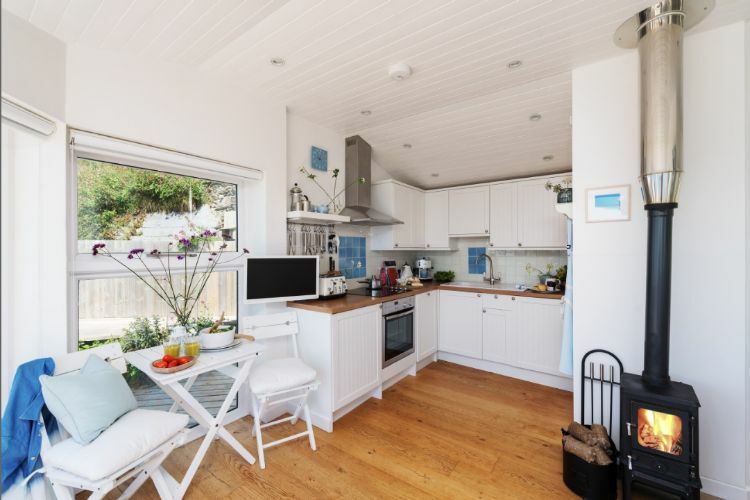 The all-white kitchen is small yet functional. The space seamlessly blends into the rest of the house with white cabinets, butcher block counter tops and blue accents in the backsplash. 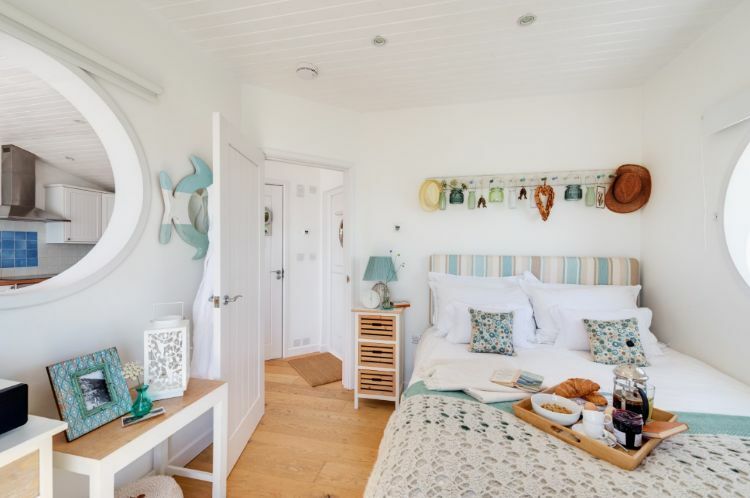 The bedroom is perfectly styled for a bright and happy retreat. Cottage details like the striped upholstered headboard and rustic wall hanging keep the room from feeling too stark. Simply the amazing location of this home makes it special, but little architectural details like this charming round window add even more character. This wall decor in the bedroom could easily be recreated in any home. Wall pegs are attached to a rustic wooden board. 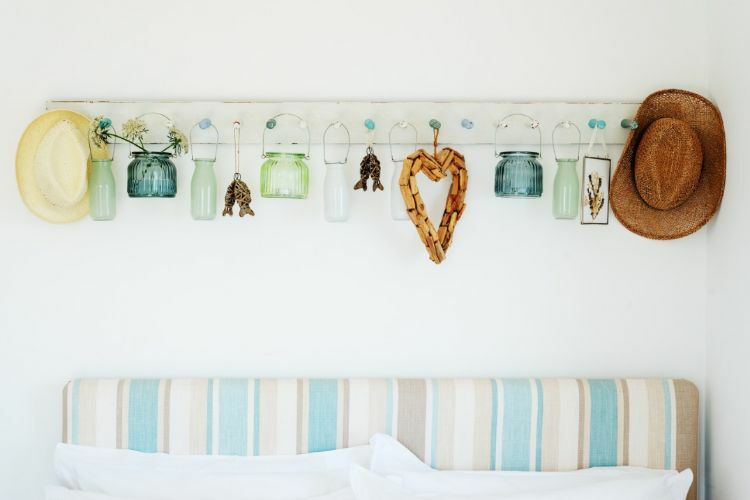 The pegs are adorned with glass jars in blues and greens with playful beach objects nestled in between. 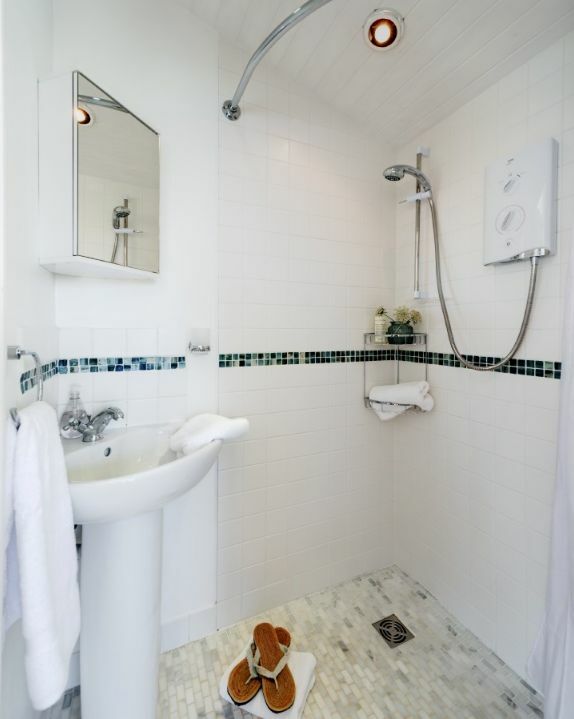 The walk-in shower in the bathroom encourages pampering with underfloor heating. Plain white wall tiles contrast nicely with the marble floor tile. 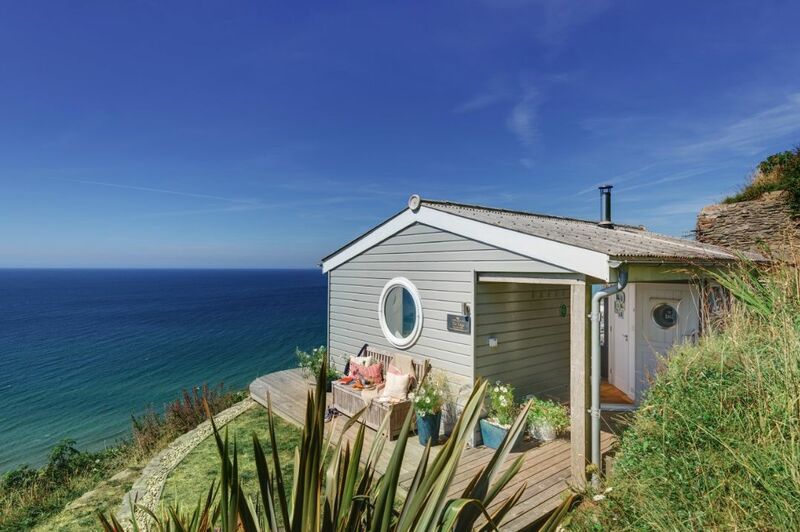 If you're interested in paying a visit to one of the many gorgeous vacation rentals offered by Unique Home Stays, visit the website or contact them at +44(0) 1637 881183.